Any material related to this project is the sole responsibility of the Union of Journalists of South Sudan and Media Diversity Institute and can under no circumstances be regarded as reflecting the position of the European Union. The 12 April 2011 was the international day of the street child but, in much of South Sudan, soon to be the world’s newest state, it has passed without notice or acknowledgement, save for a local charity in Yei which organized an event to highlight the social and economic magnitude of the problem. "We have known nothing but injustice since we were born"
Today, South Sudan is contending with the reality of a being not only the world’s newest country but, also its poorest and, as usual, this issue of the The People’s Voice includes in depth stories that capture some of the key issues and challenges facing the new nation and its citizens. Our investigative reporter, John Actually, exposes the controversial issue of rebel groups in the vast state of Jonglei. He gets an insight into the reasons why some people opt to join rebel groups and seeks the views and opinions of locals on the problem. In another story we reflect on the issue of child labour. Our reporter Benson Agele Amos spoke to several street children in Yei County who are engaged in various aspects of child labor including hawking and car washing. He also sought the views of state government officials on how the problem can be addressed. In this Special Edition of The People’s Voice we take stock of press freedom in South Sudan and reveal that the media in the world’s youngest nation is under attack. Over the last couple of years, which have been dominated by elections, the referendum on independence, and the recent establishment of South Sudan as the world’s newest state, there have been numerous and continuing infringements of press freedom, including intimidation, arrest and imprisonment of journalists, as well as the closure of media organizations. This issue of The People’s Voice brings you fresh feature stories that capture the mood of the newly independent Republic of South Sudan, ranging from reports on the hopes and expectations of the ordinary citizens to a sad story on the problem of domestic violence. It has been fully sponsored by the Norwegian Union of Journalists, who wish to support the cause of The People’s Voice and help strengthen the Union of Journalists of South Sudan. We wholeheartedly thank our Norwegian colleagues for making this edition possible. It is on this note that this issue is dedicated to reflecting on the challenges faced by, and the expectations of, the people of South Sudan. Our writer Owen Bosco went behind the scenes in Torit and spoke to people in the streets, as well as experts, about their expectations, fears and dreams for their new country. The 9th July 2011 will mark the official birth of the new nation of South Sudan. But as Independence Day approaches, the people of Southern Sudan are grappling with a myriad of problems that may undermine the future of the new nation, if not addressed urgently. It is for this reason that ‘The People’s Voice’ went behind the scenes to reveal the challenges facing the new country. Once again, our reporters traversed South Sudan, interviewing ordinary people about their predicament and seeking answers from government officials. We started the journey in the Capital Juba where high food prices are threatening to spoil the big independence party. Residents are going hungry and children are dropping out of school because the price of food has shot up beyond the reach of the common man. But why can’t Juba feeds its people? We have answers for you in this edition, complete with accounts from the victims. Welcome to the fifth edition of the People’s Voice. Like the previous issues, this edition brings you the views and concerns of the ordinary people of South Sudan. On SPLM day, as Southerners celebrated the organization that brought them independence from the north, our seasoned reporter Agele Benson Amos asked people what they now wanted from the SPLM, now that the priority has shifted from liberation to state-building. We hear from thirsty residents in the sleepy village of Abyei Cok in Rumbek, where the villagers are forced to drink dirty water for survival. The only source of water here – an old well – has to serve 596 families, together with their livestock. We listen to their complaints about government inaction. The April edition of the People’s Voice includes stories on: the plight of street children; high infant mortality rates due to lack of medical facilities in Yei River County; the problems and fear caused by sporadic Lord’s Resistance Army (LRA) attacks in Western Equatoria state and complaints from villagers over government inaction; the massive demolition of people’s homes and businesses in and around Juba city, by Government bulldozers without sufficient warning or compensation, leaving thousands homeless and with huge losses during the rainy season; a profile of South Sudan’s iron lady, Adelina Tito, Paramount Chief of Eastern Equatoria state; the skyrocketing prices of commodities in markets, and the impact this is having on people’s lives; and the devastating disease that is wiping out cattle in Lakes State. The March edition of the People’s Voice includes stories on: the poor conditions in Yambio State Hospital; the unfortunate death of one of the leading female media figures in South Sudan - Apollonia Mathia; the South Sudanese ‘Arrow Boys’ - a community policing outfit protecting their neighbours from the LRA; a cry for help from taxi operators in Yei River County pleading with the police to provide training on road safety; conflict over land in Western Equatoria leading to a humanitarian crisis with more than 15,000 people displaced; and a story about a man who tried to kill himself after being branded as a witch doctor. Click here to read the pdf version of the People’s Voice for March. 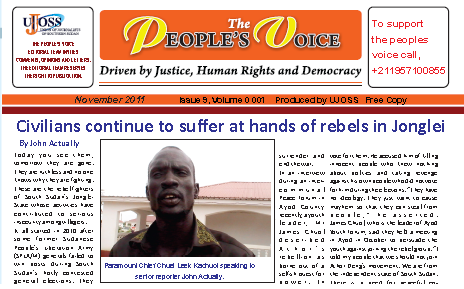 The February edition of the People’s Voice was published in the new state of South Sudan. Articles include stories on: how Southern Sudanese across the world celebrated the birth of the new nation; a project that will provide electricity to rural areas in South Sudan; the beginning of a project that will give the new country its first highway; and advice from a 115 year-old granny in South Sudan to those who will be building the countries future. 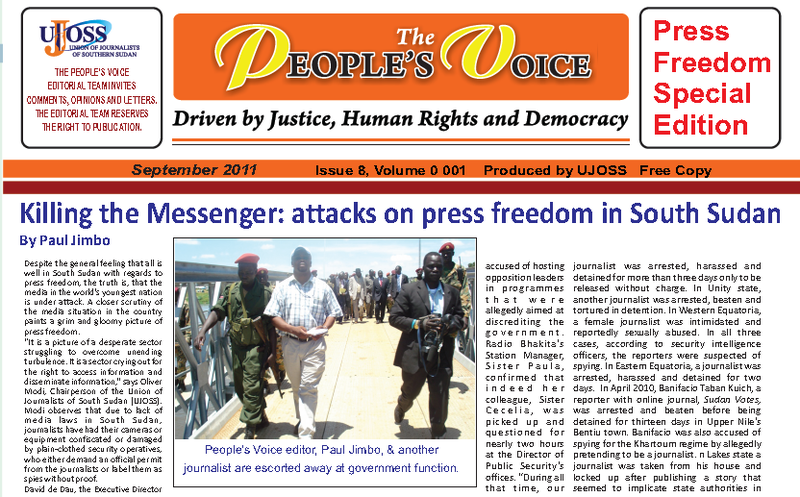 The first edition of the People’s Voice was published in January 2011 prior to the referendum on independence and includes articles on the image of women in the media, water shortages in Juba, and the referendum. To read the full articles in this edition and other articles by journalists trained through the project see the articles section.